This spot takes us back to the days when people didn’t necessarily combine their grocery shopping with piles of (plastic) bags and loads of wrapping material that goes along naturally with foraging nowadays. At Lunzers you can try a less-packaging (equals less garbage) approach. How it works: Bring your own receptacle, preferably glass jars or textile bags and get going! The vessels you bring will be weighed at the counter so you won’t be charged more than you fill in. If you’re spontaneously stopping by and therefore didn’t bring your own packaging, no problem! You can alternatively buy glass vessels and really stylish homemade textile bags right in the shop. 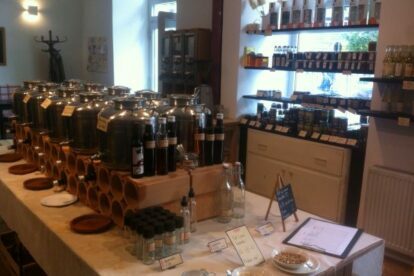 The goods: a collection of organic oils and vinegars which you can pour from metal containers – which might make you feel slightly like an alchemist-, going on: grains, nuts, spices, herbs and teas which you’ll simply take out of jars, and a fine selection of pestos and salsa produced nearby – you can also find Dazu‘s products here, just as well as the bred-from-coffee-grounds mushrooms by the Viennese start-up Hut und Stiel. Also, there is a daily lunch offer for the ones that feel like sticking around for a while. The meals, just like the rest of the goods sold here, are all organic, partly obtained from local farmers. Feel your hipster beard tingle already? You might want to pay this one a visit, shopping here feels quite rewarding!